Crowns build up a tooth to restore normal function and appearance, They replace the entire surface of the tooth recreating the correct shape and colour of the tooth and protect the remaining tooth structure. 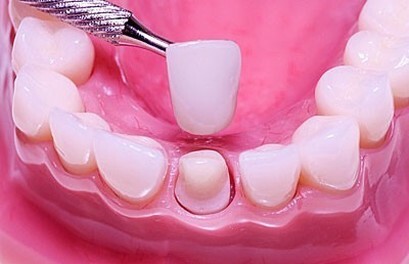 They are custom-made for each tooth and cemented onto the tooth permanently. They can be made of Gold, Gold and Porcelain (where the gold cannot be seen, also known as porcelain fused to metal) or entirely of porcelain (all-ceramic). Crowns are indicated for teeth with very large fillings, teeth that have had a root canal treatment, fractured teeth and misshapen and/or discolored teeth.